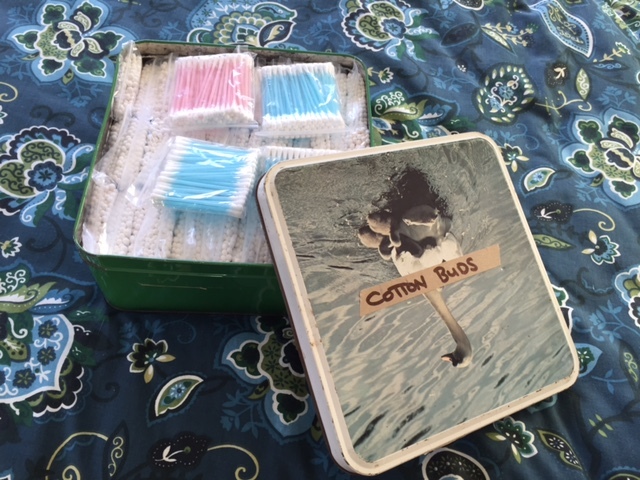 When we got back from our California trip on Wednesday, as I was putting the sunscreen back into the bathroom vanity unit, I found we had a slight leak and our small stash of cotton buds had got wet and ruined. Later the same day I mentioned this to my Dad, saying how lucky we were that it wasn’t worse as the box was nearly empty. Later the same afternoon he turns up with this large vintage baking tin completely stuffed full with cotton buds. The tin is even labelled on the outside, the inside has my Grandmother’s name on it. There are approximately 40 packages of 70 cotton buds in this tin – I’ll do the maths for you, thats over 2000 cotton buds. Now I don’t know about you, but I don’t use a lot of cotton buds. Lets say I use one a week, what the heck, lets use them with wild abandon and use 2 a week. This is 20 years supply. Dad says “let me know when you need more, I have 4 more tins of them”. I’m intrigued to know why your grandmother had 14,000 cotton buds; that’s one heck of a collection. One of the many mysteries of her estate. She was a hoarder and a collector. I think having grown up through the depression, the urge to have “stuff” took over. They used to go to Australia on holiday each year and likely they were cheap – and lightweight – so easy to bring back. Gotta admit, that is a lot of q-tips. I think I use maybe 4 a week. I wash my hair twice a week, when I wash my hair, I wash my ears… I have to dry my ears or they will ache. But even I think I’d have a problem using 2000 of these… maybe you can use them to do your nails. Sometimes I do, I’ll put a little nail polish remover on one and use that to get the polish off of my skin… not sure what else you could use it for. I love that tin though and the fact that it was your grandmothers makes it all the better. This was my observation about buying Q-tips at Costco. The package had 2000 of them in it. I use 1/day after showering but what am I going to do with 6 years of Q-tips?